Introduction: Most chronic hepatitis B (CHB) patients in China are primitively treated with a combination of lamivudine (LAM) and adefovir dipivoxil (ADV). Although antiviral resistance can be avoided with this combination therapy, using it can have harmful side effects related to ADV, specifically kidney and bone injury. This study was designed to compare viral suppression and kidney safety when switching LAM and ADV combination therapy de novo to entecavir (ETV) monotherapy in patients with CHB and compensated hepatic cirrhosis. Materials and methods: In total, 360 CHB and compensated liver cirrhosis patients who received treatment of LAM and ADV combination therapy for more than 1 year were included in this study. One hundred and eighty patients continued combination therapy to serve as a control group and the other 180 patients were switched to ETV monotherapy to serve as the experimental group. The total course of therapy was 3 years. Laboratory studies were done every 3 months to measure liver and kidney function. Studies included glomerular filtration rate (eGFR), HBV-DNA, urine β2-microglobulin (β2-M) and retinol binding protein (RBP). Results: In the experimental group, an HBV-DNA level below 20 IU/ml was found in 77.65%, 85.88%, and 94.77% in years 1, 2, and 3, respectively. In the control group, HBV-DNA levels were below 20 IU/ml in 69.66%, 75.42%, and 85.80% in years 1, 2, and 3, respectively. Low HBV-DNA levels in the experimental group were significantly less common than in the control group on the second and third year; P values were 0.009 and 0.006 for years 2 and 3, respectively. The cumulative genetic mutation rate was 3.49% in the experimental group and 8.88% in the control group (P=0.044). Decreases in eGFR more than 30% from baseline were found in 0%, 0.56%, and 1.74% of patients in the experimental group and 4.49%, 9.14% and 14.79% in patients in the control group in the first, second, and third year, respectively. Serum creatinine more than 50 μmol/L above baseline was found in 0%, 0% and 1.74% of patients in the experimental group and 1.12%, 4.00% and 5.32% of patients in the control group in years 1, 2, and 3, respectively. The urine β2-M and RBP levels were abnormal more often in the experimental group than in the control group. Conclusion: Switching to ETV monotherapy can decrease HBV-DNA levels, reduce the genetic mutation rate, and prevent renal damage caused by LAM and ADV combination therapy in patients with CHB and compensated liver cirrhosis. Patients receiving LAM and ADV combination therapy de novo should be switched to ETV monotherapy immediately. Lamivudine (LAM) was the first approved oral drug to treat hepatitis B virus (HBV) infection. Its introduction brought about a new era in the treatment of chronic hepatitis B (CHB); however, the use of LAM is limited because it is associated with a high rate of antiviral resistance. Combination therapy with adefovir dipivoxil (ADV), as well as other methods, has been widely accepted to decrease the occurrence resistance and relapse after achieving complete remission. [2, 3] Although combination therapy with ADV can prevent the development of resistance, it does not prevent the side effects of ADV, specifically injury to the kidney and bone. Because of the risk of developing resistance, LAM and LAM combined with ADV are not recommended as the first-line drug for HBV infection. The first-line agents currently recommended are entecavir (ETV) and tenofovir disoproxil fumarate (TDF), for which emergence of resistance is very low. [5, 6] TDF may also increase the risk of kidney damage. [7-9] ETV demonstrated superior virologic efficacy and greater improvement of liver histology compared to ADV monotherapy or LAM monotherapy in patients with chronic hepatitis B. 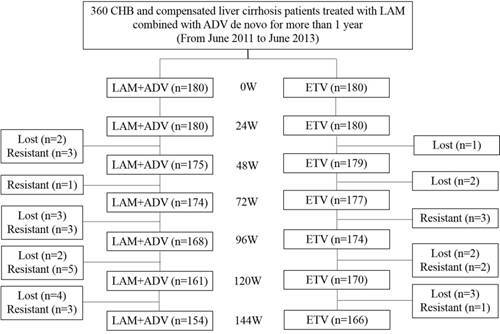 Is it safe and efficacious to switch LAM and ADV combination therapy de novo to ETV monotherapy in patients with CHB and compensated liver cirrhosis? There is still no effective clinical evidence on this topic. This study was designed to analyze the efficacy and safety of switching LAM and ADV combination therapy de novo to ETV monotherapy in patients with CHB and Compensated Hepatic Cirrhosis. In this study, 273 patients with CHB and 87 patients with HBV infection and compensated hepatic cirrhosis from the First Affiliated Hospital of Zhejiang Medical University (Hangzhou, China) between June 2011 to June 2013 were enrolled. Pathology was confirmed based on medical history, physical examination, laboratory findings, ultrasound and radiological signs of cirrhosis. Patients with CHB and compensated hepatic cirrhosis were diagnosed according to the guideline of prevention and treatment for chronic hepatitis B (2010 version) proposed by the Chinese Medical Association Chinese Society of Hepatology and Chinese Society of Infectious Diseases. All patients were adults ages 18 to 65 years and received de novo therapy of LAM and ADV for more than 1 year. Patients coinfected by hepatitis C-like virus, hepatitis delta virus or human immunodeficiency virus (HIV) were not included. Patients with HCC, alcoholic liver cirrhosis, autoimmune hepatitis, decompensated liver cirrhosis, hepatorenal syndrome, hepatic encephalopathy, spontaneous bacterial peritonitis, or other diseases such as cardiopathy, nephrosis, and cerebropathy were not included. Patients with an estimated glomerular filtration rate (eGFR) ≤ 60 ml/min/1.73 m2 were also excluded from this study. Informed consent was obtained from all patients and they understood all aspects of the experiment. The agreement was received by the Ethics Committee of the First Affiliated Hospital of Zhejiang University. The project was carried out as a prospective case-control study. Of the 360 patients enrolled, 180 patients continued LAM and ADV combination therapy as the control group. The other 180 patients were switched to ETV monotherapy as the experimental group. Patients were randomly assigned to a group. Baseline data from both groups were compared to confirm comparability. The experimental group patients received 0.5 mg of ETV daily, and the control group patients received 100 mg of LAM and 10 mg of ADV daily. The experiment used commercially available enzyme immunoassays (Abbott Laboratories, Chicago, IL, United States) to detect serum hepatitis B viral markers. Serum HBV-DNA was tested using polymerase chain reaction (PCR) with a linear range between 20 and 1.8 × 108 IU/mL (Roche Light Cycler 480 Real-time PCR System, Switzerland). Measurements from both groups were taken at the beginning of weeks 0, 24, 48, 72, 96, 120 and 144. Follow-up clinical assessments including physical examination, serum hepatitis B viral markers, HBV-DNA quantitative check, serum biochemistry, α-fetoprotein, kidney function, blood coagulation time, and ultrasonography were also performed. The eGFR (detected as mL/min/1.73 m2) was calculated using the Chinese formula [175 × Pcr1.234 × age0.179 (female × 0.79)]. Kidney injury was defined as a decrease in eGFR to below 50 mL/min/1.73 m2. Urine β2-M and RBP of urine were also measured; 0.000-0.025 g/mol creatinine was considered normal. Patient status after 144 weeks is shown in Figure 1. Continuous variables were presented as the means ± SD and compared between the groups using Student's t test. Serum HBV DNA levels were compared after conversion to a logarithmic scale. Proportions were presented as percentages (%), and rate comparisons were performed using the χ2 test. The cumulative incidence of urine β2-M and RBP abnormalities were calculated using the Kaplan-Meier method, and group data were calculated using the log rank test. Statistical analyses were performed using SPSS version 16.0 (SPSS, Chicago, IL, USA). P values less than 0.05 were considered significant. Over the course of the study, of the 180 patients in the control group, 11 were lost to follow-up and 15 underwent genetic mutation. Of the 180 patients in the experimental group, 8 were lost to follow-up and 6 underwent genetic mutation. During follow-up, 1 patient was found to have developed liver cancer in year 2, and another patient was found to have developed liver cancer in year 3 in the control group. In the experimental group, 1 patient developed liver cancer in year 3. No patients developed complications such as ascites, hepatic encephalopathy, and upper gastrointestinal bleeding in either group. Baseline characteristics of patients from the study and control groups were presented in Table 1. No significant differences were found between both groups. The baseline level of HBV-DNA was 2.11±0.49 log IU/ml in the control group and 2.14±0.45 log IU/ml in the experimental group. During follow-up, the percentage of patients with HBV-DNA levels below 20 IU/ml were 69.66% (124/178), 75.42% (132/175) and 85.8% (145/169) in the control group and 77.65% (139/179), 85.88% (152/177) and 94.77% (163/172) in the experimental group in years 1, 2 and 3, respectively. The occurrence of virological response in the experimental group was higher than in the control group. Of the 180 patients in the control group, 1.69% (3/178), 4.00% (7/175) and 8.88% (15/169) had genetic mutations in years 1, 2 and 3, respectively. Eight patients had the rtM 204V mutation, five patients had the rtM204I mutation, one patient had the rtN236T mutation and one patient had the rtA181V+N236T mutation. By comparison, 0% (0/179), 1.68% (3/177) and 3.49% (6/172) of the 180 patients in the experimental group had genetic mutations in years 1, 2, and 3, respectively. Three patients had the rtM204V, rtL180M and rtS202G mutations and two patients had the rtM204V, rtL180M and rtT184A mutations. The results of the two groups were significantly different by the third year (P=0.044), as shown in Table 2. Alb: albumin; ALT: alanine aminotransferase; TBil: total bilirubin; Cr: creatinine; eGFR: estimated glomerular filtration rate; β2-M: Urine β2-Microglobulin; RBP: Retinol Binding protein; P values of independent t test. Flow chart of the status of CHB and compensated liver cirrhosis patients treated with LAM with ADV combination therapy de novo for more than 1 year followed by continued treatment with LAM and ADV combination therapy or ETV monotherapy for 144 wk. LAM: Lamivudine; ADV: Adefovir dipivoxil; and ETV: Entecavir. The cumulative occurrence of urine microprotein abnormalities is shown in Figure 2. In the control group, urine β2-M abnormalities developed in 2.25% (4/178), 4.57% (8/175) and 7.69% (13/169) of patients, and urine RBP abnormalities developed in 1.69% (3/178), 4.00% (7/175) and 8.28% (14/169) of patients in the first, second, and third year of treatment, respectively. In the experimental group, only 0.58% (1/172) of patients developed a urine β2-M abnormality, and only 1.16% (2/172) of patients developed urine RBP abnormalities in the first, second and third year, respectively. Compared with the experimental group, the occurrence of urine β2-M abnormalities in the control group was significantly higher (P<0.001). The trends of the serum creatinine and glomerular filtration rate in the control group and experimental group are shown in Figure 3. The mean ± SD values of serum creatinine were 56.25±7.52 μmol/L, 60.36±8.11 μmol/L and 67.21±10.13 μmol/L in the control group at the end of the first, second, and third year, respectively. There was also an increasing trend in the serum creatinine in the experimental group. Mean ± SD values were 55.16±6.21 μmol/L, 56.56±7.03μmol/L and 57.11±8.19μmol/L for years 1, 2 and 3, respectively. We also examined the eGFR in both groups. The mean ± SD eGFR values were 91.73±7.63, 87.41±11.62 and 82.38±12.15 in the control group in the first, second, and third year, respectively. In contrast, there was a decreasing trend in eGFR in the experimental group; the mean ± SD eGFR values were 93.81±5.92, 92.11±6.19 and 91.77±6.28 at the end of first, second, and third year, respectively. Baseline levels were maintained throughout the treatment course. Further analysis demonstrated that for the control group, 4.49% (8/178), 9.14% (16/175) and 14.79% (25/169) of patients had an eGFR decline of more than 30% compared to the baseline in years 1, 2, and 3, respectively. By contrast, the experimental group did not have any patients with an eGFR decline of more than 30% compared to the baseline in the first year. Only 0.56% (1/177) of patients in the second year, and 1.74% (3/172) of patients in the third year had such a decrease in eGFR. We also observed dynamic changes in the serum creatinine in the two groups during the 3 years of treatment. By the third year, 1.12% (2/178), 4.00% (7/175), and 5.32% (9/168) of patients had a creatinine increase of more than 50 μmol/L from baseline in the control group, but only 1.74% (3/172) of patients had an increase in creatinine more than 50 μmol/L from baseline in the experimental group. More details are shown in Table 3. Using eGFR<50 ml/min/1.73 m2 as the definition of renal function impairment, 0.56% (1/178), 2.29% (4/175) and 4.73% (8/169) of patients had renal function impairment in the control group in the first, second, and third year, respectively, but only 0.58% (1/172) of patients had renal function impairment in the experimental group at the end of the third year. Cumulative incidence of urine microprotein abnormalities after continuing to receive LAM plus ADV combined treatment or switching to ETV monotherapy in chronic hepatitis B and compensated liver cirrhosis patients. Cumulative incidence of A: Urine β2-microglobulin abnormality; and B: Retinol-binding protein abnormality. Dynamic change in the creatinine and estimated glomerular filtration rate (eGFR) values in the group that continued to receive LAM plus ADV combined treatment and the group that switched to ETV monotherapy. LAM was the first anti-HBV drug in China. Because of its convenience, definitive curative effect, and limited side effects, it has become the mainstay treatment of HBV infection. [1, 12] The disadvantage of LAM is its high incidence of drug resistance with long-term treatment. Based on the literature, initial LAM antiviral treatment for CHB patients has YMDD gene resistance rates of 23%, 46%, 55%, 65% and 71% after the first, second, third, fourth, and fifth years of use, respectively. One oral prodrug of adefovir is ADV, which is an analogue of adenosine monophosphate. Intracellularly, adefovir is metabolized to adefovir diphosphate, which inhibits HBV-DNA polymerase. Due to the lack of cross resistance between ADV and LAM, telbivudine (LdT) or ETV, ADV combination therapy is widely used in LAM, LdT, and ETV salvage therapy after resistance develops or initial combination therapy fails. [15, 16] However, in patients with CHB long-term treatment with ADV can potentially cause renal impairment and hypophosphatemia. In Tanaka M's study, of the 292 patients treated with ADV combined with LAM, 9.6% patients developed kidney injury during a therapy duration of 64.3 mo. Our results showed that during each of the three years of treatment for the control group, creatinine was elevated by at least 50 μmol/L compared to baseline in 1.12%, 4.00%, and 5.32% of patients, respectively. Decreases in eGFR by more than 30% of baseline occurred in 4.49%, 9.14%, and 14.79% of patients in years 1, 2 and 3, respectively. On the other hand, the experimental group had stable creatinine and eGFR levels. Current evidence has indicated that in CHB patients, treatment with ADV increases the risk of renal dysfunction, but the mechanism remains unclear. [18, 19] It may be related to drug accumulation in the proximal tubules after long-term use of ADV. Such drug accumulation may induce reabsorption of microproteins (β2-M and RBP), glucose, amino acids, calcium, and phosphorus. Regular laboratory testing of serum or urine are important for early detection of and risk assessment for renal impairment because this condition is still reversible after prophylactic or therapeutic intervention. [20, 21] In our present study, in the 13 patients with urine β2-M and /or RBP abnormalities, urine RBP and β2-M increased gradually while eGFR decreased. Our results strongly suggest that if urine RBP or β2-M abnormalities are detected in CHB patients, LAM plus ADV therapy should immediately be switched to ETV monotherapy. NA-resistance pathways (rtM204I/V, rtN236T and rtA181T/V) have now been characterized. The rtM204V/I pathway is responsible for resistance to the L-nucleosides, which include LAM, LdT and ETV, while the rtN236T pathway is responsible for ADV and TDF resistance. [22, 23] Because LAM and ETV resistance is accomplished via the same pathway, some might worry that switching therapy from LAM combined with ADV to ETV monotherapy will increase resistance. Our study showed a rate of viral genetic mutations in the group that switched to ETV to be higher than the group that continued to receive LAM combined with ADV. Of the 180 patients who continued to receive LAM and ADV combination treatment, 1.69% (3/178), 4.00% (7/175), and 8.88% (15/169) had genetic mutations in the first, second, and third year, respectively. On the other hand, only 0% (0/179), 1.68% (3/177), and 3.49% (6/172) of the 180 patients who received ETV monotherapy had genetic mutations consequently on the year 1, 2, and 3. In conclusion, it is safe and effective to switch LAM and ADV combination therapy to ETV monotherapy when treating patients with CHB and compensated liver cirrhosis. Switching therapy for patients with CHB and compensated liver cirrhosis who have received LAM plus ADV therapy for more than 1 year to ETV monotherapy can improve the virological response as well as reduce ADV-associated renal impairment during long-term treatment. As a result, replacement should be considered as soon as possible. This work was supported by National Key Program for infection diseases of China to YD Yang (2013ZX10002001), the Zhejiang Nature Science Foundation of China under grant No. LQ14H160011 and National Natural Science Foundation of China under Grant No.81402097. This study was approved by the Ethics Committee of the First Affiliated Hospital of Zhejiang University.